With a storyline that promises to mix together King Arthur, Nazis, and massive, three headed robot dragons, it’s clear Michael Bay is going all out (even more so than usual) for Transformers: The Last Knight, his fifth go-around with the popular Hasbro toy line. 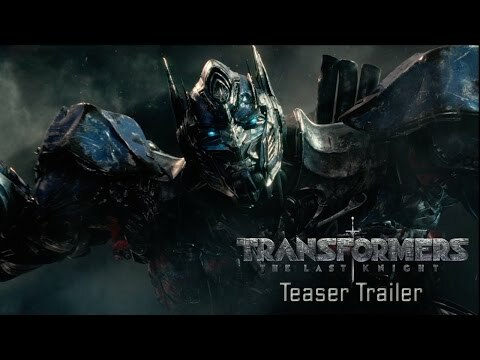 The first trailer has arrived, and surprisingly, it’s incredibly slow and somber, as an Anthony Hopkins narration sets up a Transformers/Human war and dark times ahead for everyone involved. That is until about half way through, and we get what we came to see: explosions, giant robots punching each other (interestingly, it’s Optimus Prime and Bumblebee this time round), and some trademark Bayhem. Being a teaser trailer, much of the story is kept back, but there are heavy hints that we will finally see Unicron, the planet sized transformer previously brought to life by Orson Welles in the animated movie. He’s a pretty visually arresting character, and I’m really surprised Bay hadn’t included him in any previous instalments. Add to that a seemingly evil (or brainwashed. Yeah, going with brainwashed) Optimus Prime, and it looks like Bay is looking towards the original cartoon for inspiration this time round.